A year or two ago I hung up some of my general purpose tools (pliers, wrenches, screw drivers, etc…) on the wall. It made a huge difference in my shop. I was no longer using my adjustable wrench or pliers when I should be using a wrench because now the wrench was accessible. My shop was cleaner because each tool now had a specific place to live, and of course I could also tell when something was missing immediately. 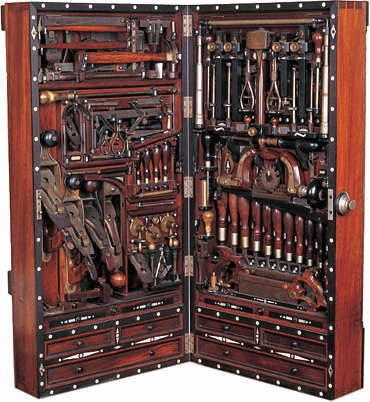 With that in mind I have been considering building a tool case for my woodworking tools. This past September I started on the project. By the end of October I had most of the case work finished. The work slowed down when I decided to put on two coats of wipe-on poly -there is a lot of surface area to cover! And of course after that I had to start making all of the little tool holders… I still have a few more of those to make but I decided to post pictures of where I am to date. -The case is 48” tall, 32” wide with the doors closed, and 13-1/4” deep. -Baltic Birch plywood: 3/4” for the sides of the case. 1/2” for the doors and the back. 5/8” for two of the shelves and the inner doors. - Hardware from Horton Brass (except for the piano hinges). 2. I had to build a box-joint jig for this project. The zero clearance insert made a HUGE difference in reducing tear-out in the plywood. 3. Laying out the tool locations is hard. I finally realized that I just needed to make a lot of tool holders and then figure out where everything should go. The tool holders are just screwed in. 4. I saw a great tip on LumberJocks to cut the chisel holders at a 5 degree angle so that the tips tilt back toward the cabinet and the handles stick out a little. It makes a big difference in getting them in-and-out without cutting your fingers on the sharp chisels above. 8. Depending on your shop this may not be the best way to store your tools. You do not want this cabinet hanging over your bench because even with the doors open it sticks out 10” from the wall. If you have to have your bench underneath your tool storage you are better off hanging the tools on the wall. Nice cabinet, great build! An inspiration piece for sure! Should prove pretty helpful in keeping organized. That tool cabinet is so nice. You’ve done a fine job on it. Nicely done, you’ll have fun filling it. Well done. A great way to organize a lot of wood working tools. Very nice cabinet, I made my tool cabinet like yours, Though not as detailed. I hung mine above my bench/work space so I could mount a 24” florscent light to the bottom of the cabinet. Worked well in my case, the ceiling lights are 15’ up, not very good for working with small details. Wow oh wow! I wish i saw this a few days ago. I started on a small till style cabinet for some random hand tools and such.